There is a gas station I pass by every single day on my way home from work. 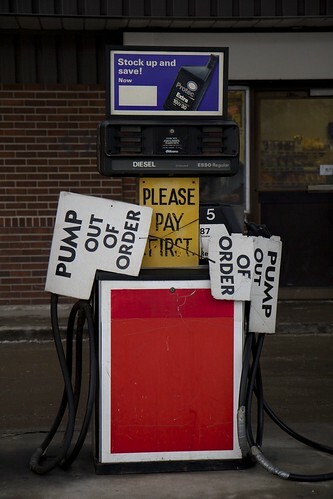 I only recently noticed that despite having a large and prominent display on price for gas, every single one of their pumps reads “Out of Order”. I think what struck me first was how old the signs looked. This entry was posted on February 7, 2012 by debbe. It was filed under 365, Life, Winnipeg and was tagged with 365, gas, gas station, out of order, pump, pump out of order, Winnipeg.